Moo Shu’s business hours puzzled me. 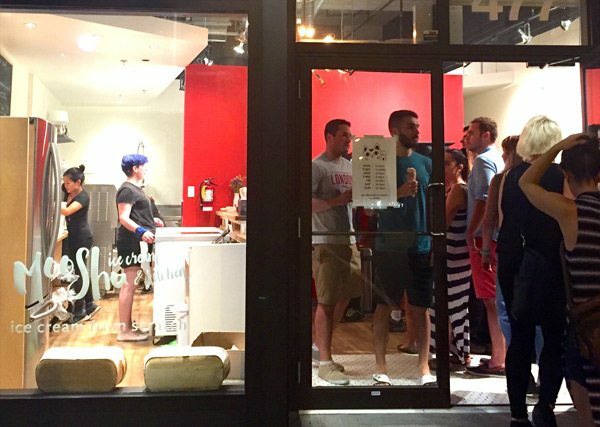 Most weekdays, the Bank street storefront opens at 6pm and closes at 10. Who, I thought, goes for ice cream at night? And without a little kid in tow? I walked over after a downtown dinner to find out. Nine-thirty on a Wednesday night, and the queue astonished me. It spilled out of the shop and onto the sidewalk – grown men and women, waiting patiently for ice cream cones. 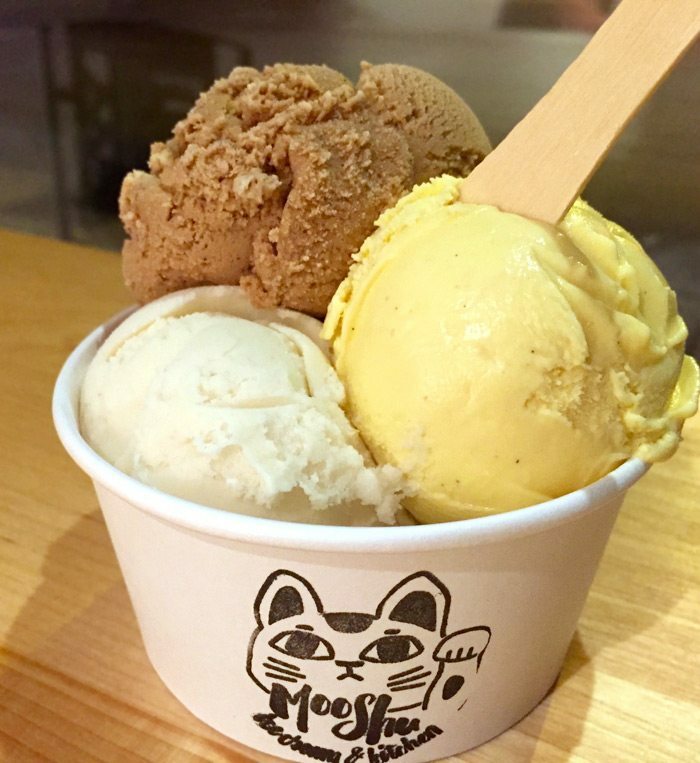 DeBrisay says she’s become a huge fan of Mok’s Asian-inspired, adult flavoured ice creams. 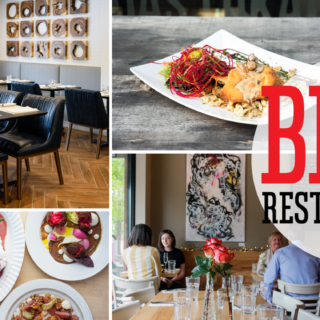 But there’s more than ice cream at Moo Shu’s new Bank Street location. So we joined in to find out what all the fuss was about. 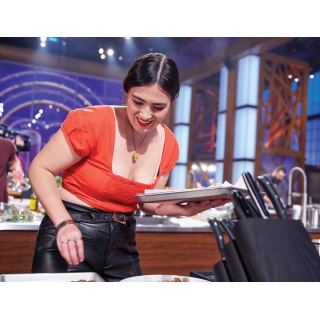 I have tried – and written about – Liz Mok’s ice cream truffles, found in restaurants like Sen and Tomo (where, I have said, you should save space), and have sought them out whenever I bumped into her Moo Shu stall at the Ottawa Farmers’ Market or at a festival. I’ve become a huge fan of her Asian-inspired, adult flavoured ice creams. I love how clean they taste, how potent their flavours, how refreshingly uncloyingly sweet they are. When I heard she was opening a shop, on Bank Street, across the street from Wilf & Ada’s (and the new home of Three Tarts), I did a happy dance. Then wondered what, other than ice cream on a hot summer night, would sustain the business. Light lunches are the plan. Hong Kong inspired, like the recipe she inherited from her Chinese grandmother for BBQ pork and rice, or the crazy-popular Coca-Cola chicken wings. That’s coming for fall, but for now, Liz and her team are focusing on ice creams, working with the base custard that is the “blank palate” on which she can build flavour. She works with the seasons (roasted peach from Warner’s Farm with cardamom) and teams up with local purveyors (Michael’s Dolce jams, Top Shelf Preserves and Happy goat Coffee all feature here) to keep the rotating flavours – three per week – along with the ‘Sunday Specials’ (torched peach ice cream pie) good reason to join the queue. 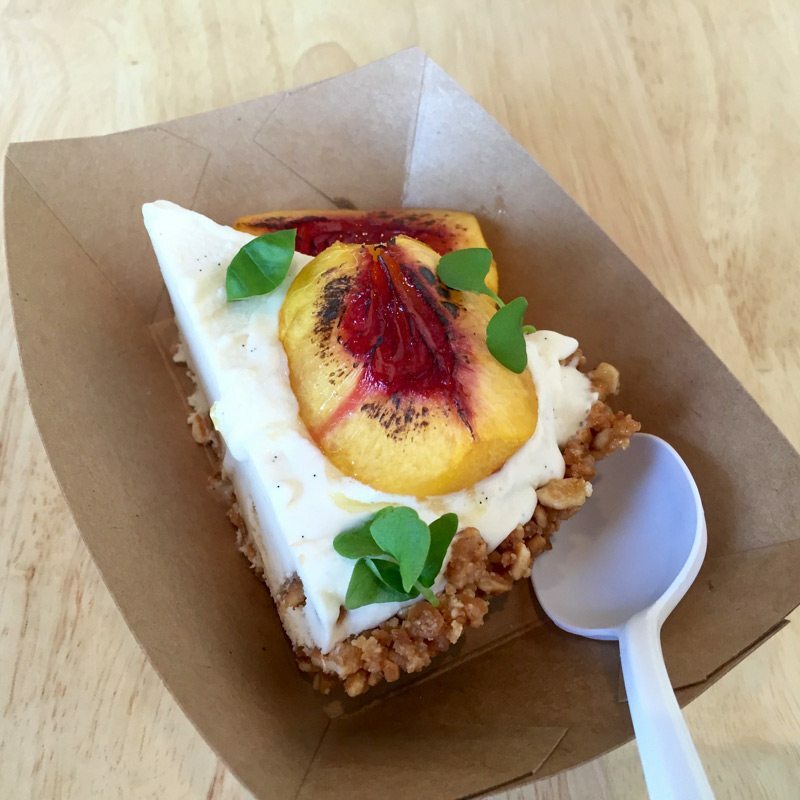 ‘Sunday Specials’ (like this torched peach ice cream pie) are good reason to join the queue. Open Monday, Wednesday and Thursday, 6-10pm, Friday and Saturday, noon to 11pm, Sunday, noon to 10pm, closed Tuesday. Cost: from kids’ size $3 up to $7 for large (3 flavours). Take-away pints are $12. Truffles by order only.